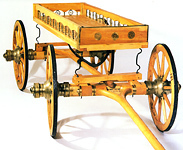 Hallstatt and early La Tène "princely tombs" (Fürstengräber) contain first four-wheeled wagons (e.g., Hochdorf), later two-wheeled chariots (e.g., Kleinaspergle). The identification of this category of tombs depends, in part, on the presence of such wagons. In some cases, the body of the deceased is laid out on the wagon or chariot inside the tomb; in others, the wagon is placed beside or directly over the body/bodies. Wamser traces the origin of the practice of wagon burial to seventh-century Eastern Europe, which in turn transmitted the more ancient practice from the eastern steppes and the Mediterranean cultural zone [1981, 225]. Although, as Wamser notes, Greek mortuary assemblages never include wagons, his interpretation of Hallstatt wagons is based on eighth-century Greek Geometric vase paintings depicting wagons drawn by two horses. On these vases, the deceased is portrayed lying on the wagon box. Files of mourning figures accompany the deceased in procession. Both the iconography and the find sites of these vessels indicate a funerary reference, specifically the transportation of the corpse or ekphora (Ahlberg-Cornell 1971). Hallstatt wagons, by analogy, are thought by some to have been used and indeed specifically constructed for the same purpose (Wamser 1981, 227). Recent analyses and reconstructions of a large number of Hallstatt wagons have revealed that they were equipped with a pivoting front axle and, as proven by clear evidence of repairs and traces of wear, the wagons had been in use before their deposition in the tomb (e.g., Pare 1992). Their burial in the tombs, often in dismantled form (e.g., Vix), indicates an important role in "Celtic" beliefs regarding the hereafter. A person of high rank was equipped with many items, presumably for use in the afterlife, among them the wagon and harness for two horses. It is interesting to note that horses themselves are not included in the assemblages. 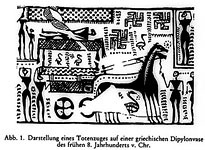 Greek burials, on the other hand, lack wagons; if the interpretation of Geometric vase paintings is correct, the wagon plays a central role in the rituals preceding the burial and not in the provision for the afterlife. In addition to this disparity between the mortuary assemblages of these cultural groups, the diffusionist explanation fails to demonstrate any means of transmission of the Greek ekphora practice to the later Hallstatt "Celts." 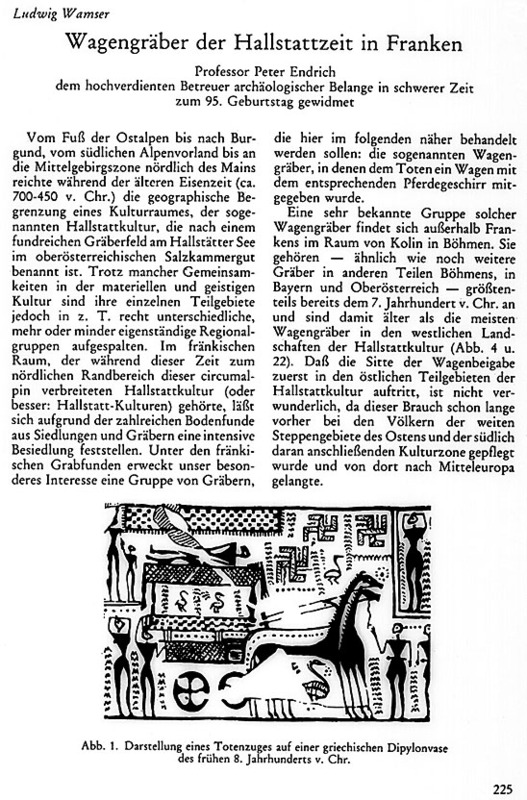 Greek Geometric vases were not exported into the Hallstatt lands. Thus, there is no evidence for Hallstatt familiarity with, and misunderstanding of, Greek Geometric vases, or imitation of Greek pre-deposition funerary ritual.